Sticking to my blog resolution of restyling old pieces into new outfits, here is a rework of the leather skirt previously seen in this post. A more downtown alternative. Which look do you prefer? that grey tee looks incredible! I think I like it styled in the other post better because I would be able to wear that to work :). This look is really nice also. i love both styling they both have such different vibes, the previous one could be worn to a business meeting whereas this could be worn [almost] anywhere! awesome skirt. I actually like both ways that you've styled this look; each is lovely in their simplicity and minimalistic feel, although this one definitely is a more downtown alternative. Something I like that's different in this outfit is that while the previous one had a lot of focus on structure, this one has more of a focus on the mixture of textures. Heh, I'm quite looking forward to seeing what other pieces you end up restyling! Have a great rest of the week! I like both ways you styled that skirt! I really like the simplicity of this one and the bag looks great with it. Loving the black and grey darling, gorgeous leather! I like this combination better. I like the tee because it's a little basic but has something that makes it great. The skirt is amazing! Very simple and very beautiful, this is a great expression of style in its best form. Less is always best and that is exactly what this outfit shows. 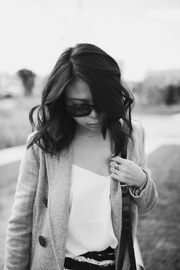 Your personal style and blog is exceptional. Your photography and outlay make it very easy and enjoyable to read, plus I lived in New Zealand, Auckland for 2 years so makes me all the more happy to continue reading. Gorgeous skirt ! Nice top too !! And the bag.. Yeah well the bag... it's just perfection! I'll be checking out more often! Just not a fair question... both looks rock! That skirt is something special. LOVE the detailing. How do you keep from wearing it every single day? I honestly don't think I could choose between the two, they're both such amazing looks in different ways. This one is way edgier, a style that I tend to immediately associate with you. 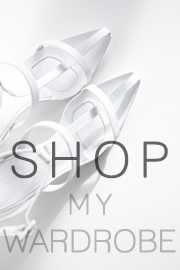 Good for you for restyling, it shouldn't be that hard anyway with all the amazing pieces you own! I seriously always have such wardrobe envy. I'm jealous of this look. It's freakin cold here in MN. you look great! Hi Marcella! Thanks for visiting me earlier! I love this look on you! The skirt and handbag are amazing, and I love how you wore just a simple casual tee with it. You look effortless in this! Have a good day! you look totally stunning and we are so much in love with your leather skirt! awesome look.. that bag is perfection! first time on your blog and i love it! such an amazing outfit :) following! 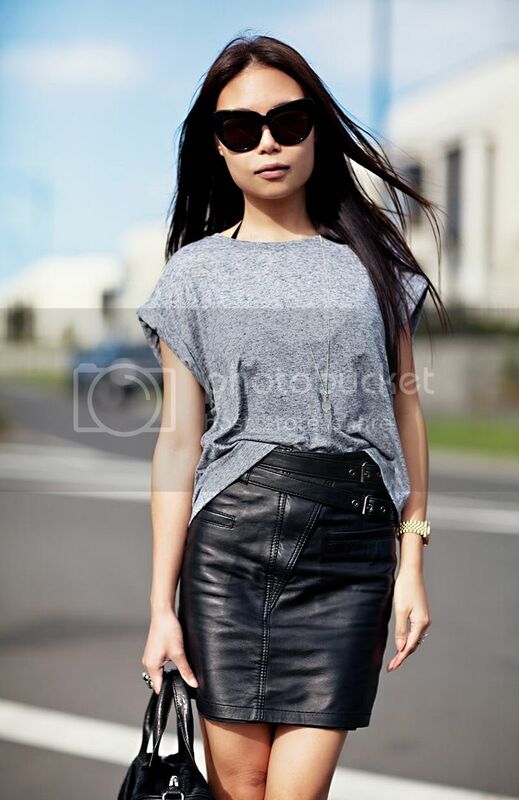 The grey tee looks very good with a leather skirt! Makes me think of the T by Alexander Wang line. You look very pretty! Both are amazing, and I love that you're showing how versatile the skirt is. I love it when bloggers repeat pieces! love this look . . . great bag! You're so tiny! Great outfit. Lovely look once again. Your House of Harlow sunnies are very cool. Great shots!